Time is running out to register for our two Texas life science marketing events. Our Texas Medical Center and Texas A&M University have 19 and 12 spots left, respectively. These shows are both very well attended. Last year, the Houston BioResearch Product Faire™ Event attracted 518 attendees, of which 126 were purchasing agents, professors and post docs, and 73 were lab managers. These attendees came from 40 different research buildings and 70 on-campus departments. 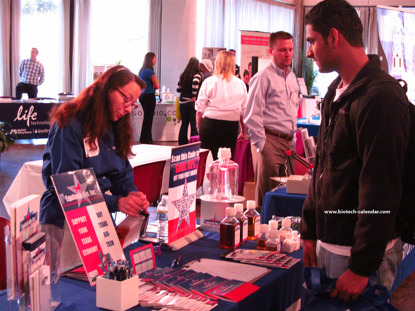 That same year, the College Station BioResearch Product Faire™ Event attracted 175 attendees. Of those attending, 33 were purchasing agents, professors and post docs, and 33 were lab managers. These attendees came from 31 research buildings and 27 departments. Exhibitors love exhibiting with Biotechnology Calendar, Inc. because we offer easy and economic life science marketing opportunities that help you sell lab equipment. The universities we work with are well funded, and we draw relevant crowds of researchers, lab managers and purchasing agents with the power to make lab product and service purchasing decisions. Researchers enjoy attending our Texas life science marketing events because we provide the opportunity to network with colleagues and other life science professionals. We also provide a delicious catered lunch and prizes such as t-shirts and iPads. Texas Medical Center and Texas A&M University both receive a significant amount of life science funding, making these institutions potentially profitable markets. Lab suppliers interested in life science marketing opportunities in Texas may also be interested to know that Texas A&M received $36.8 million from the NIH in 2013. In addition to receiving life science funding from the NIH, Texas A&M University was also awarded $15.8 million from the NSF in 2012. For more NIH and NSF funding statistics on Texas A&M University, including a breakdown of 2012 NIH departmental funding at the university, see $58M in Funding for Potential Lab Sales Leads at Texas A&M. Another reason lab suppliers value Biotechnology Calendar, Inc. Texas life science marketing events is that we provide additional brand promotion through our sponsorship program. We offer three levels of sponsorship packages, including Gold Level Sponsorships, Silver Level Sponsorships and Bronze Level Sponsorships. Some of the features of these packages include full-page, half-page or quarter-page advertisements in our event programs, sponsorship ribbons, seminar space and distribution rights to lanyards and event bags. Sponsors have access to an extended mailing list of Texas lab product expo attendees. This high quality data is double-checked for accuracy to save you time when reaching out to attendees at our Texas Medical Center and Texas A&M University life science marketing events. For more information on sponsorship opportunities, click here. If you are a lab supplier interested in selling lab equipment in Texas, Biotechnology Calendar, Inc. invites you to exhibit at our Houston BioResearch Product Faire™ Event on January 30, 2014 and our College Station BioResearch Product Faire™ Event on January 31, 2014. There are a limited number of spaces left for these events, so make sure to register today! Biotechnology Calendar, Inc. is a full-service science research marketing and events-planning company that organizes life science marketing events at top research institutions nationwide. For more life science marketing opportunities closer to home, see our 2014 calendar of events. If you’d like to learn more about our Texas events, click on the buttons below.